A new apartment means new reasons to entertain. Since moving into a new city dwelling a month ago, I have been updating recipes and sifting through my cookbook collection. This past weekend, I invited a few friends over for an impromptu dinner. While still settling in and a bit crazed, “make ahead” and “one-dish” were echoing in my head. 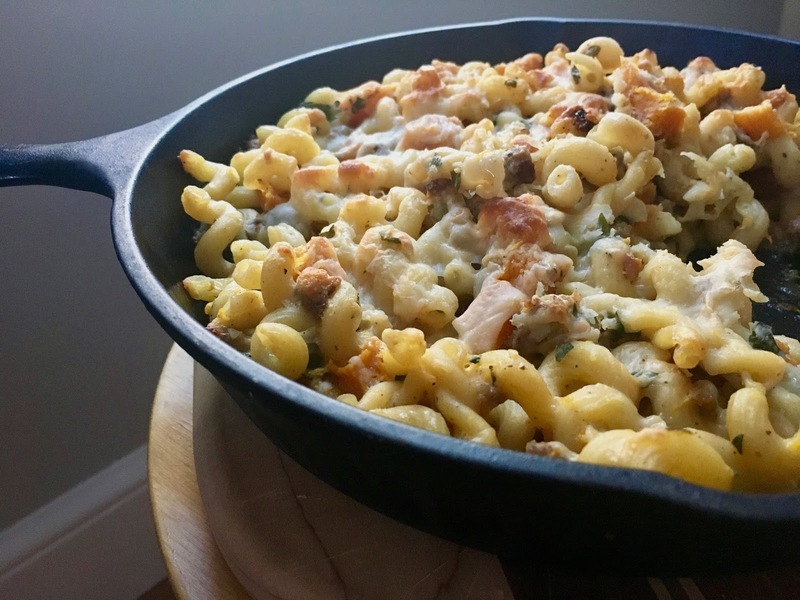 As I opened my newly organized pantry doors and looked out the window to a typical New England spring day of sleet and cold, a hygge-inspired dish of warm, cheesy pasta and sausage seemed necessary. To balance the salty, nutty Bechamel sauce, I added some butternut squash for sweetness, caramelized onions for depth and zing, and chopped parsley and lemon juice for freshness. I baked everything in my big cast iron dish with a simple salad, crusty Iggy’s bread and lots of vino. On a lined baking sheet, toss the butternut squash cubes, rosemary, ½ teaspoon salt, ¼ t black pepper and a generous drizzle of EVOO. Roast for 40-45 minutes until the cubes are tender and lightly browned. Meanwhile, bring a large pot of salted water to a boil. Add the pasta and cook as directed. Drain and return the cooked pasta back to the large pot. In a large shallow pan, heat 1 T EVOO over medium heat. Add the sausage, breaking it up with a wooden spoon until it starts to brown, about 3-5 minutes. Remove the sausage and add it to the large cooked pasta pot. In the same shallow pan, reduce the heat to low and add 1 T butter and 1 T EVOO. Add the onions, season with salt and pepper, and cook about 20 minutes until they become golden and lightly caramelized. Add the chopped garlic and saute for 1 more minute. Once lightly caramelized, add the onions and garlic to the large cooked pasta pot. At this point, the butternut squash should be nearly finished roasting. Remove the pan from the oven and add the butternut squash cubes to the large cooked pasta pot. Reduce oven heat to 400 degrees Fahrenheit. To make the Bechamel Sauce, bring the shallow pan back up to medium heat. Add 4 T butter. Once melted, whisk in ¼ c flour and continue to whisk until smooth. Gradually, drizzle in the milk while whisking. The sauce will be quite thick at first, but will thin out as you add more milk. Once all of the milk is added, add the nutmeg and season with salt and pepper. Let simmer for 5-7 more minutes. Add the Bechamel to the large pasta pot. Add ⅔ c Parmigiano and 2/3 c Provolone, fresh parsley and lemon juice. 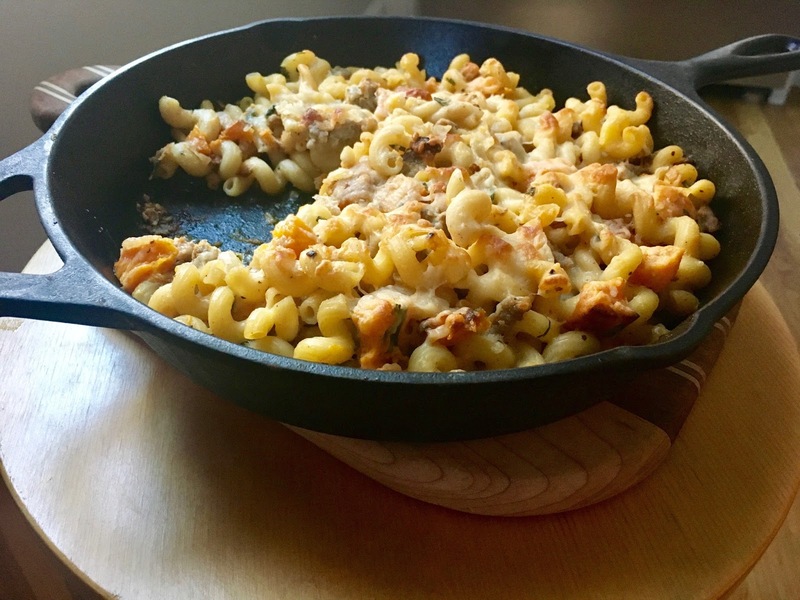 Pour the pasta mixture into one large, 17-inch cast iron skillet or one 9x13-inch baking dish. Sprinkle with the remaining Parmigiano and Provolone. Bake for 20 to 25 minutes, until the cheese is melted and pasta around the edges are slightly golden and crispy. Feel free to make this ahead of time! After you pour the pasta into the baking dish, cover with aluminum foil and refrigerate. When ready, just sprinkle with the grated cheese and pop into the preheated oven.